At first glance, the thousands upon thousands of leaf-cutter ants in Robert Schofield’s laboratory suggest nothing so much as chaos. They swarm over the terrain in glass aquariums and dart through a complicated maze of plastic tubes, relentlessly crawling over and around one another as they pursue tasks that seem apparent only to them. But look closely: Young adults use scalpel-sharp mandibles to cut pieces of Himalayan blackberry leaf with the precision of a seamstress and “foragers” dutifully carry the fragments off to the nest. “Generalists” wiggle these leaf pieces into the nooks and crannies of a fungal garden that provides the colony with its sustenance and “gardeners” tend it. And there are “majors”—the biggest ants, two or three times the size of the smallest—who, like bulldozers, keep trails clear of debris so this entire operation runs smoothly. For Schofield, the tiny leaf-cutter ant is a model social insect, one bearing important clues about how complex behaviors evolve in simple organisms. It’s not the area of focus you’d expect from a senior research associate in the University of Oregon physics department. But Schofield is an interdisciplinarian, merging principles from physics, biology and materials science in pursuit of his passions. As a physicist, Schofield scours the cosmos for collisions of black holes. Einstein theorized that these events produce “gravitational waves”—ripples in the space-time continuum that transport energy but have yet to be directly detected. Schofield has already made a splash with the leaf-cutters. In 2010, he discovered that the ants switch jobs after their keen-edged mandibles have dulled; it was the first suggestion that some social insects stop performing certain tasks after they become inefficient. This discovery drew attention from the BBC, U.S. News & World Report, NPR and other media, many of them riffing off the idea of “social security” for insects. Schofield’s latest queries into the world of insects and arthropods owe as much to economics and materials science as they do biology. With the leaf-cutters, Schofield is studying “energy economics”—the notion that the ants are shrewd economists, deriving slightly more in “energy profit” from the leaves than they expend to harvest them. The researcher is simultaneously probing the composition of the jaws, leg claws, stingers, fangs and teeth of scorpions, spiders and nereid worms; these arthropods’ “tools” are composed of little-studied biomaterials containing zinc, manganese and other heavy elements, presumably providing optimal resistance to fracture. Schofield has discovered a surprising amount of crossover between biology and physics. 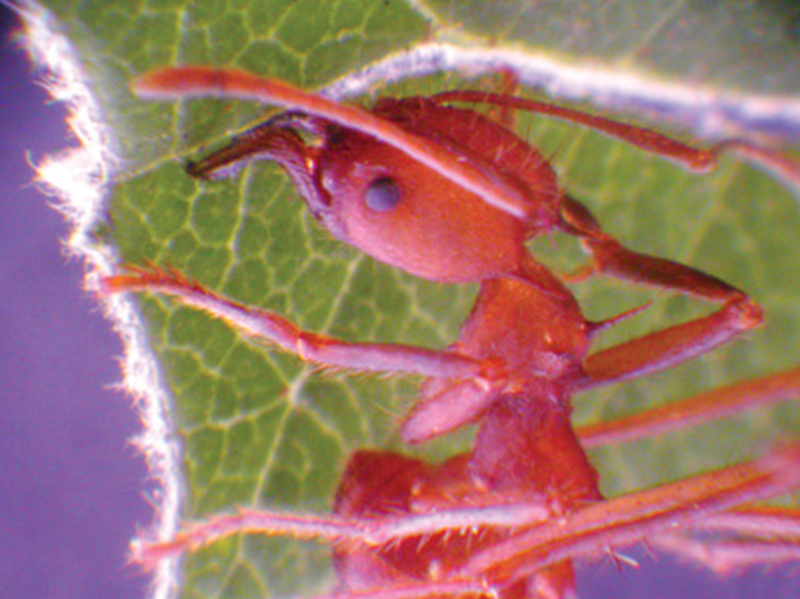 Micromanipulators, for example, are used in physics to guide the path of a laser beam; Schofield reconfigures them to steer an ant mandible through a leaf, allowing him to measure force. Similarly, many of the calculations Schofield uses in biology are the same as those he incorporates in his work at the Laser Interferometer Gravitational-Wave Observatory, the location of a massive astronomical search that includes more than 800 scientists at fifty institutions. For Schofield, this cross-pollination of disciplines is all in a day’s work.